In an age of dime-a-dozen “found footage” horror movies clogging the mainstream, it’s understandable to have given up hope for the genre. This said, the past year or two has seen the indie film community coming the a genre’s rescue yet again, this time with some really innovative ideas for horror. Jennifer Kent’s “The Babadook” is a great example of the genre dropping most of the horror-film elements one might be conditioned into thinking are vital to the genre. Despite this however, the simple Australian indie flick proves that a lack of gore and jump scares can still make for a good- if not great- horror film. The horror in this film takes an interesting approach, preying less on the viewer’s obvious fears and more on the viewer’s nostalgia. “The Babadook” depicts a mother, Amelia, on the brink of collapse attempting to raise her impossible son, Robbie. Upon discovering a book containing the character of “The Babadook” in the basement one night, Amelia decides to read it to her son. Unfortunately however, Robbie begins to see the character all around the house and at school, the two both begin to lose their minds. Details in this film’s approach to horror make it all the more surprising that this is Jennifer Kent’s directorial debut. A great example is the terrifying demon who his rarely seen, an aspect of the film that is often sloppily executed in such films as the most recent Insidious and Sinister entries. A shortcoming however in her approach is her characters and their occasional lack of rational motivations. Without spoiling, there are many decisions made by the two primary characters that could not possibly spell out a positive outcome, and it can become frustrating to constantly see Amelia or Robbie walking into danger seemingly without a clue. As for these two, the roles of Amelia and Robbie are acted quite exceptionally by Essie Davis and Noah Wiseman. 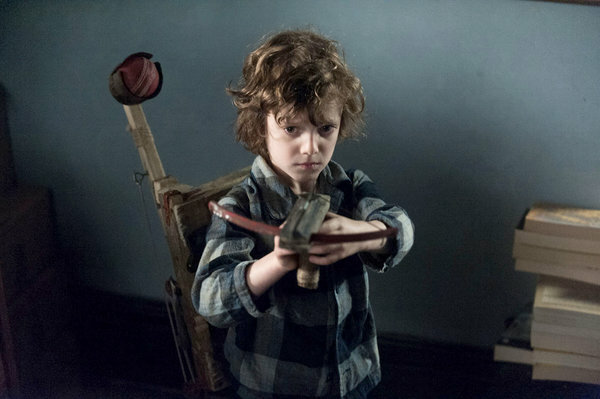 While Essie Davis is consistently impressive and Noah Wiseman is certainly better than the average child actor, but their chemistry with one another is where the two actors really shine. There is something about a character slowly losing his or her mind that allows an actor to show their versatility, and these two are certainly no exception. While certainly not perfect, it’s hard to think of a film in 2014 with as many scares as this directorial debut. “The Babadook” as well as other films like “It Follows” have been on fire in the last two years, and if the horror genre needs saving, indie flicks like these are probably gonna be the ones to do it. This entry was posted in Articles, REVIEWS and tagged essie davis, horror, indie, it follows, jennifer kent, noah wiseman, review, the babadook. Bookmark the permalink.